I love paint. I love to see it spread across paper, wood, waxed paper and even my fingers. I love how it mixes together to make yet another cool color. When I was growing up I shared my space with my older sister, who was messy and I was obsessively neat. I'm talking, everything on my dresser was line up like little soldiers waiting for inspection. I lived like that for many years. I am not neat at all now. In fact, if my sister walked into my house/studio... she would probably have a stroke due to the shock. I could probably tell you all kinds of psychological reasons for this change in me. I had control issues, I was the third and baby of the family for many years.... bla bla bla..... you get the idea. The reason for this long story, you might be thinking? Part of my mess comes from never wanting to throw away a piece of paper that has color on it. I don't see it as trash. I see it as a potential background. This entire page was done with leftover pieces of other projects. I was running out of space to work. All those papers were creeping into my work area on the table. This type of project is therapy for me. I go to this quiet place inside myself and I just tear paper and glue. It is so soothing. The large blue butterfly was left over from another project. The little butterflies were made using two Stampin' Up punches and more pieces of leftover paper. Butterflies are a go to for me. 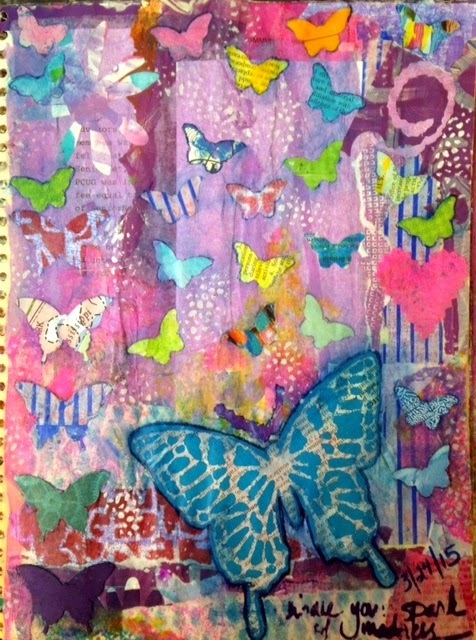 I had this background and not idea what to put on it... so once again... the butterflies appear in my journal. Maybe I use them because they remind me of freedom. If you feel stuck or the blank page is scaring you, try this technique. Don't think too much, just tear paper and glue. You'll end up with a wonderful and unique background. That background might be the finished piece or the jumping off spot for another piece. Either way, you've created!! Thank you... it's a fun way to clean up. Great way to clean up. Love what you've done with the torn paper. Looks great. Thanks, I love to work with torn paper. Very pretty page...I hear you girlfriend...I used to be called Felix like the odd couple Felix because I was such a clean freak. I used to wash my floor every single night before bed when my daughter was young...now I am a creative mess too... I have paint on almost everything I touch! At least it confined to my creative area but people would be very surprised...I do at times clean up though...for my own sanity! You get older and priorities change! You are so right...messy can be a good thing...in art! Like the use of all the papers bringing about the colors and patterns into your art. This is a great page, and inspiring post. Visiting for the first time from PPF. we had this mass of butterflies in the garden this week...but they weren't as pretty as this... just a bit boring in black and white... great page, and I am happy you have come over to the dark side and joined the gloriously messy!! Love your art therapy page. You are right - sometimes we just need time to play with color, paint and glue! Thanks for stopping by... I appreciate you taking the time to tell me what you think. Loving the bright colours, gives the piece such vibrancy!